An ad-hoc committee (see membership list below), with oversight from the Board on Behavioral, Cognitive, and Sensory Sciences, will inform U.S. Army policy, procedures, and future research through an exploration of recent and emerging science related to the measurement of individual capability and the combination of individual capabilities to create collective capacity to perform. 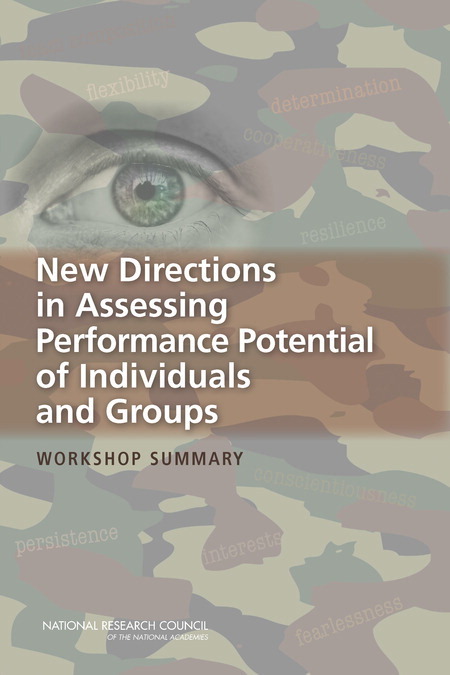 The committee planned-workshop and final report will assist the military to make the next leap forward in assessment of individual potential and capability utilizing emerging theory and state of the art practice in measurement. This study will be carried out in two phases: 1) Phase 1 will cast a wide net to capture a variety of ideas about measuring human capabilities from across research fields, and 2) Phase 2 will assess current research and recommend an agenda for future U.S. Army Research Institute (ARI) research in the most promising areas. Each phase has a separate and distinct statement of task to guide the committee’s work (please see the National Academies’ Current Projects site for both statements of task). please see the Workshop page here. Facilitate interdisciplinary dialogue and the combination of individual capabilities to create collective capacity to perform. This study will be accomplished in two phases, spanning a total of 30 months during which the panel will meet a total of five times and produce two publications. During Phase 1 (12 months), the panel will meet twice and will host a two-day public workshop to identify and discuss new and unique methods for measuring individual capabilities and predicting individual and collective performance. The proceedings of the workshop will be summarized and published. During Phase 2 (18 months), the panel will meet an additional three times to conduct additional data-gathering and analysis to answer the Phase 2 study charge. The focus of Phase 2 will be the development of the study's findings, conclusions, and recommendations for the final report. Leaetta Hough, Dunnette Group, Ltd.
For Committee biographies, see the Committee Membership page.